Toruń owes its origins and initial growth to the Hospital of St. Mary of the Germans of Jerusalem, or, in short, to the Teutonic Order - the German military order. It was the Teutonic Knights that arrived here from Kuiavia in 1230. Having crossed the Vistula river and entering the Land of Chełmno, they established their first fortified settlement soon afterwards. It was granted its charter of incorporation and the name of Toruń (Thorun) in 1233. The settlement was their first fortified base, from which they started their conquest of pagan Prussia and where they started to build their powerful monastic state, which shaped the history of this part of Europe for the centuries to come. If not for their decision to settle right here, who knows what the future would have held for Toruń. It is by no means certain whether it would have come into being at all. The first reference to the Teutonic Knights running the hospital of St. Mary in Jerusalem (a papal fief formed in 1099 following the first crusade) appeared in 1127, in documents which described the Order as dependant on the Joanites, whereas Peter of Dusburg, the author of the 14th-century chronicle of the Teutonic Order, mentioned the year 1190 as the date of establishing the Order. In 1198 it was transformed into a military order, and a year later taken under Pope Innocent’s III protection. Its main principles included the care of the sick and protecting pilgrims on their way to the Grave of the Lord in Jerusalem, as well as crusading against the so-called infidels. The governing bodies of the Order, answerable directly to the Pope, were the Grand Master and the chapter, who had resided in Acre in Palestine until 1291. They failed to play any significant role in the Holy Land, however. Facing the Muslim pressure in Palestine, Grand Master Herman von Salza started making efforts to move the Order to Europe, entertaining the hope of establishing their own state there, the more so because the pagan Baltic nations (the Old Prussians, Lithuanians, Yotvingians, Latgalians, Curonians, Livonians and Sambians) were becoming increasingly interested in crusading. In 1211, Hungarian King Andrew II, invited the Teutonic Order to defend Hungary southern border against the nomadic Cumans. However, the moment the Order started to pursue their own policies within the country and repudiated the authority of the King, turning the bestowed land into a papal fief, King Andrew II removed them from Hungary in 1224-1225, despite huge papal protests. Meanwhile, in the Polish land, the Princes of Poland pursued their efforts to christen and subdue pagan Prussia. The Old Prussians were part of the Baltic peoples which by the end of Antiquity and the beginning of the Middle Ages had settled in the historic area known as Old Prussia, between the lower Vistula and Neman. They were culturally and linguistically connected to pagan Lithuanians and Latgalians and consisted of a large number of tribes, including Pomezanians, Pogesanians, Varmians, Sambians, Natangans, Barts, Nadrovians, Skalvians, Yotvingians, and Sasnias. In the Land of Chełmno (i.e. its southwest part occupied by the Old Prussians, among the Vistula, Drwęca and Osa rivers) a network of watchtowers was erected, the most important being that of Radzyń Chełmiński (seized by Polish King Bolesław Śmiały's (Boleslaus the Brave's) army in 1015 in Old Prussia), guarding the border and serving as a base for the christening of Prussia. The christening was led by the Archbishop of Gniezno, Henryk Kietlicz, who in 1210 was appointed a papal legate there. Shortly afterwards, however, in 1215, Pope Innocent III established the Missionary Bishopric of Old Prussia and bestowed it on German Cistercian Christian, who had previously received 23 settlements and 100 villages of the Land of Chełmno from Polish Prince Conrad I of Mazovia in 1222. In 1217, Pope Honorius III forbade the Polish crusaders to enter Old Prussia without Christian’s consent. Christian’s expeditions were, however, highly ineffective, especially as the Prussian raids on the Land of Chełmno escalated in 1220s. Hence, the first references to inviting the Teutonic Order to the Land of Chełmno, after they have been driven out of Transylvania, come from 1225. The very idea of locating the Teutonic Order on the border of Poland and Old Prussia was most probably put forward by the Bishop of Płock, Günter, (at the time, the District of Chełmno was part of the Diocese of Płock) and Prince of Wrocław, Henryk Brodaty (Henry the Bearded). The references to it come from the so-called Golden Bull of 1226, issued by Caesar Frederick II in Rimini, Italy, which laid a legal foundation for the Teutonic State. In 1228, following the long negotiation process, the Teutonic Order was summoned by Prince Conrad I of Mazovia to christen and fight against Old Prussia. The bestowal of the Chełmno Land on the Order was confirmed by Caesar Frederick II, who additionally allocated them the lands they would conquer fighting with the Old Prussians. Thus, against the intention of the founder, the Teutonic Order found the legal base for establishing an independent state in the Polish land. The negotiations commenced in early 1230 and were concluded by a bull issued by Pope Gregory IX on 18 January 1230. Why did they decide to locate the city there? Undoubtedly, it was the attractiveness of the area situated along the Vistula, on the border of fertile soils of Kuiavia and the Land of Chełmno, that became a decisive factor. Here run the old trail from Kuiavia and Silesia towards the Baltic Sea with the crossing point on the Vistula river. It was along the trail that the arrivals from Kuiavia and Greater Poland had been populating the primeval area of the Land of Chełmno since probably as early as the 7th century. It was used by merchants travelling to the southeast coast of the Baltic Sea in search of amber, as well as by the already mentioned Polish crusaders heading for Old Prussia in the early 13th century. In 1230-31, the Teutonic Knights entered into agreement with missionary Bishop Christian (in 1222, he received a number of bestowals in the Disitrict of Chełmno from Prince Conrad I of Mazovia), who was expected to give them one third of the conquered Prussian territory in return for their help (keeping the rest and the authority over the land to himself). In 1233, the bishop was taken captive by the Sambians, which the Teutonic Order used to their advantage and accepted the whole of the so far conquered Prussian territory from the Pope. The Order perceived the Cistercian mission as a threat to pursuing their political goals, namely, creating their own state. In the District of Chełmno, both the Order and the Bishop were answerable to the Mazovian Prince, while in Prussia, Christian was their superior as the Pope’s representative. In 1231-1233, the Teutonic Order extended control over the whole of the District of Chełmno. Initially, the crusades consisted mainly of the Polish knights. Following the papal appeal, however, an increasing number of crusaders from Western Europe began to pour into the country. The expeditions advanced along the Vistula and Vistula Lagoon; in 1237, a stronghold in Elbląg was established, facilitating transport of supplies from Germany by sea. In 1233-35, the Teutonic Order joined forces with the Order of Dobrzyń (summoned to support the Cistercian mission, led by Bishop Christian in the first half of the 13th century, under the patronage of the Princes of Poland; they received the Land of Dobrzyń), and in 1237 with the Brethren of Sword of Livonia. The latter was established by Bishop A. von Buxhövden in 1202 and run the conquest of the North Baltic peoples. Having lost the battle with the Lithuanians in 1236, the Brethren decided to merge with the Teutonic Order. Supported by the Holy Roman Empire and the Pope (in 1234, Pope George IX declared the lands seized by the Order and those yet to be conquered 'the property under St. Peter’s jurisdiction'; in 1245, Caesar Frederick II issued a new 'Golden Bull', which not only confirmed the bestowal of Old Prussia on the Teutonic Order in 1226 but also extended it to include Lithuania and Ruthenia), the Teutonic Order established their own monastic state in the captured territory, seeking to expand its borders to their neighbours' disadvantage. Having seized Livonia, the Order attempted to conquer Ruthenia in 1237. However, they were defeated at Lake Peipus in 1242. Later that year, a violent conflict with the Prince of Gdańsk, Świętopełk, ensued (started by seizing Zantyr by the Teutonic Knights; Zantyr was a settlement founded on the Nogat river by Świętopełk in the early 13th century) accompanied by the Prussian rebellion (the so-called First Prussian Uprising). The fighting lasted 4 years; the Prince was declared the enemy of Christianity and was immediately confronted by the Teutonic Order and the Princes of Greater Poland and Mazovia. During the war, Toruń was among the Teutonic fortresses that were not conquered. In 1249, i.e. in the fourth year following Christian’s death, the Old Prussians were eventually forced to accept Christendom. In 1260, they rose against the Teutonic Order once more (the so-called Second Prussian Uprising). Heavy fighting ensued nearly in the whole of the territory between the Neman and Vistula rivers, while some of the insurgent divisions reached as far as Toruń. The Teutonic Order was suffering severe defeat, strongholds were being captured, and the Province Master Helmerich himself and over 40 monastic knights fell in the battle of Lubawa. It was then that, at the invitation of Pope Clemens IV, the Prince of Brunschwick and the Margraves of Misnia (Meissen) and Brandenburg arrived with their armies. The uprising ended in 1274 and by 1283 the whole of Old Prussia had gone into the hands of the Teutonic Order. Around 1280, rapidly developing Toruń became a member of the Hanseatic League. In 1308, the Teutonic Order seized Gdańsk Pomerania (depriving Poland of sea access) which marked the beginning of a long lasting conflict between Poland and the Teutonic State. The most important battle was the battle of Płowce, Kuiavia, on 27 September 1331, resulting in the Teutonic Order’s defeat and a large moral significance for Poland. The first stage of the conflict ended in 1343 with the Peace of Kalisz. From 1309, the Grand Master of the Teutonic Order resided in Malbork (Marienburg). The key to the political power of the Teutonic Knights was their excellent administration and economic organization (trade and craft development as well as colonization), which brought them very much to the fore in mid 14th century in the Baltic Sea basin. It was evidenced in the power of Toruń, the city which enjoyed a leading political and economic position in the Teutonic State. The incessant conflict with Lithuania brought the Order international fame and attracted crusaders, but, on the other hand, resulted in losing its religious character by the Order. The threat the Teutonic Order posed to Lithuania was one of the reasons underlying concluding the union between Poland and Lithuania in Kreva in 1385 and christening of Lithuania in 1386. The union jeopardized the position of the Teutonic Knights in this part of Europe, as it deprived them the reason to remain there. Therefore, they did not recognize the christening and immediately embarked on wide-ranging propaganda campaign, accusing the Polish of supporting the enemies of Christendom. In August 1409, the Order started the so-called Great War (attacking the Polish castle of Złotoria near Toruń, in the Land of Dobrzyń) and suffered a severe defeat at Grunwald (in Germany known as Tannenberg) in 1410. The war concluded with the First Treaty of Toruń in 1411 and led to the political and economic fall of the Teutonic Order. 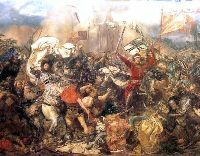 In the battle of Grunwald, Toruń demonstrated its allegiance to its Teutonic superior. It supplied the Teutonic army with a detachment of 214 soldiers, commanded by Burgomaster Albrecht Rothe. A significant number of Toruń people fell in the battle and those who survived were taken into the Polish or Lithuanian captivity (among them was a former Toruń burgomaster and recognized diplomat, Johan von der Mersche). However, the King released them a few days after the victory, demanding homage from the affluent and significant city. Hermann Balk (Teutonic Order Provincial Master in Prussia and Livonia) and Conrad I (Duke of Mazovia). Open air show in 2008 to commemorate the 775th anniversary of Torun city rights. Teutonic knights in Toruń, open-air show in 2008 to commemorate the 775th anniversary of Toruń foundation. 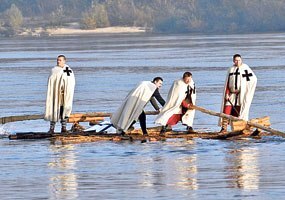 Teutonic Knights crossing Vistula river from Nieszawa (Kuiavia) to the Chełmno Land in 1231 to establish their first fortified base - Toruń. Reconstruction staging to commemorate the 775th anniversary of Toruń city rights. Teutonic Knights arrive to the Land of Chełmno, 1713, District Museum in Toruń. The picture is a literal illustration to the 14th century chronicle of Petrus de Dusburg who told the story of the beginnings of the Toruń stronghold. Click to enlarge. 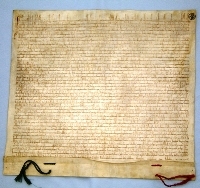 The renewal of Toruń and Chełmno Founding Act, dated October 1st 1251, State Archives in Toruń. The original Act of December 28th 1233 (probably burnt in 1244), represented a model for further locations on the basis of the so-called Chełmno Law. Gdanisko tower of the Teutonic castle in Toruń and a basin of the former Komtur Pond. 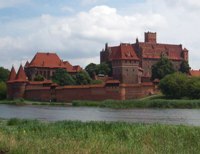 Castle in Malbork (Merienburg). Between 1309 and 1457 Malbork was a capital of the state governed by the Teutonic Knights and the home of the Grand Master. The subsequent wars with Poland (1414-1421 and 1431-1435) impoverished the people of the Teutonic State and led to a conflict with the dynamically developing cities of Toruń, Gdańsk, Elbląg, as well as the knighthood which enjoyed fewer rights than the nobility. In 1397, the nobility of the Chełmno Land established the Lizard Society, whereas in 1440, the Prussian League was formed by the representatives of knights and the cities of Prussia with the aim to fight with the Teutonic lawlessness. In 1454, an armed conflict ensued in Toruń, beginning with the demolition of the Teutonic castle. The League asked King Kazimierz Jagiellończyk (Casimir Jagiellon) for protection over Prussia (the Royal Prussia) and the latter issued the act of incorporation of Prussia into Poland. The ensuing Thirteen Years’ War turned out successful for Poland and finished with the Second Treaty of Toruń in 1466. The efforts of the Teutonic Order to reverse the provisions of the Treaty led to a new war in 1519-1521, concluded with the Truce of Toruń. Grand Master Albrecht Hohenzollern secularized the Order and, having converted to Lutheranism, transformed it into secular duchy, called Ducal Prussia. On the Main Market Square in Cracow, he received the duchy from King Sigismund the Elder in fief. The Teutonic Order in Livonia, which gained independence from the Grand Master in the late 15th century, was in fact an autonomous monastic state. The internal decline and weakening of the Livonian order led to a conflict in 1588. Facing a defeat, the Livonian Master, Gotard Kettler, secularized the order in 1561 and surrendered it to the Commonwealth of Poland-Lithuania. The so reduced order survived in Germany to be dissolved in 1808 by Ceasar Napoleon I, while the knights took shelter at the Habsburg court in Vienna. In 1918, it lost its military character and became a religious order. It had been active in Austria by 1938 and became illegal after its incorporation into the Reich. In 1947, it was recognized by the Austrian government. Today it has its headquarters in Vienna and operates in Austria, Italy, Belgium, Slovenia and Moravia. It runs pastoral, educational and charity services. The smallest administrative unit of the Teutonic State was a commandery (see: Toruń commandery). The most important matters regarding the Teutonic State were discussed during the meetings of the Grand Master with the representatives of several cities. By 1410, only the so-called 'great cities' participated in the meetings, such as Chełmno, the Old City of Toruń, Elbląg, Knipawa (Kneiphof), the Old City of Królewiec (Königsberg), Braniewo and the Main City of Gdańsk. Their representatives had the opportunity to complain to the Order and put forward their claims. Other cities had no immediate influence on the Order’s policy. Following the Grunwald defeat, Grand Master Heinrich von Plauen appointed the so-called domestic council consisting of the representation of knights and the seven great cities, as well as the representation of four minor cities: the New City of Toruń, Brodnica, Grudziądz and Tczew. The Teutonic State minted its own coin. The first mint was established in Toruń castle, followed by another one in Elbląg in the 14th century; by the end of the century, mints operated also in Gdańsk and Malbork. 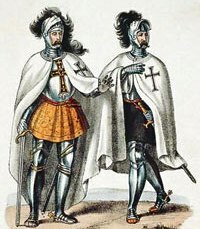 The Teutonic Order as the organisation of knights and hospitallers took little or no interest in the care of the sick. In the 13th century, there were only two castle hospitals – in Toruń and Elbląg. Two other – in Königsberg and Chełmno were established only in the 14th century. 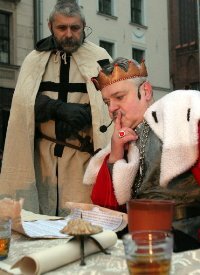 The Lizard Society, a secret union of the nobility of the Chełmno Land, was established in 1397 to fight with the Teutonic Order and protect its rights. It is very likely that its traditions had survived until the beginning of the Prussian League in 1440. The society was established by four knights: Nicholas and Hanusz of Rynsk and Frederic and Nicholas of Kitnowo. It operated in Radzyń Chełmiński and was regulated by the statutes approved by the Teutonic Order. With the Grand Master’s permission, the curator’s office of the Lizard Society was moved from Radzyń Chełmiński to St. James’s Church in Toruń in 1408. The patron saint of the office was St. Mary Magdalene, which suggests that the place in the south aisle with the Tree of Life, by the mural depicting a legend associated with her, was previously occupied by the Lizard Society’s altar. Moreover, the narrow passage near the polychrome leading to a room in the church tower might have served as the place of their secret meetings. Following the First Treaty of Toruń in 1411, Grand Master Heinrich von Plauen, violating the provisions of the treaty, took a cruel revenge on the knight opposition led by the Lizard Society, the leader of which was executed in Grudziądz. (Prussian Confederation) - founded on 14 March 1440 in Kwidzyn, it was a confederation of nobility and the cities of Vistula Pomerania opposing the Teutonic Order. It was established by the Old and the New Cities of Toruń (the latter, however, left the League in 1446, demonstrating its allegiance to the Order). The League consisted of 19 cities and 53 knights. The League was intended as a form of a protest against the tax burden and abuses on the part of the Teutonic Knights. The political in character allegations concerned the impossibility to control the city’s future by the nobility and patricians in great cities. The Old City of Toruń played a largely significant part in forming the confederation, with its council (especially Burgomasters Johan Huxer and Hermann Rusop) advocating the foundation of the organization which would ensure that “everyone would not fear for their life or property and could stand by their rights, which have been rightly and correctly ascribed to them”. 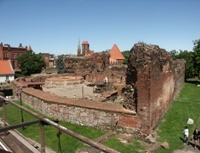 The proposal prepared by the Council of the Old City of Toruń formed the basis for the foundation act. From 1453, the League’s Secret Council, which was established later that year, resided in Toruń. The council was the representative body of the Prussian League and consisted of 8-10 members representative of knights and the great cities. Their meetings most probably took place in the non-existent house belonging to the leader of the League, Jan Bażyński, which occupied the site of the present-day building at no. 16 Rynek Staromiejski (Old City Market Square). 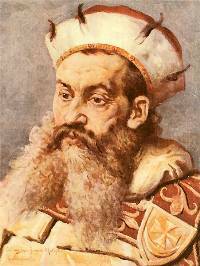 Because all the attempts to destroy the League failed, Caesar Frederick III, assuming the role of arbitrator, condemned the confederation and ordered its dissolution on the pretext of it limiting the freedom of church. The Council decided to look for protection in Poland. On 4 February 1454, the League renounced its allegiance to the Grand Master of the Teutonic Order and rose against the Order attacking Toruń castle on 6 February. After a few days’ siege, Toruń Commander, Albrecht Kalba, surrendered the castle on 8 February accepting the conditions of the surrender. The forecastle was destroyed by flames, whereas the castle proper was largely demolished. The rebellion soon spread to other parts of the Teutonic State and within a month all Teutonic castles were seized. On 10 February, the League sent a delegation from Toruń to ask Polish King Kazimierz Jagiellończyk (Casimir Jagiellon) for protection and the incorporation of Prussia into the Polish land. 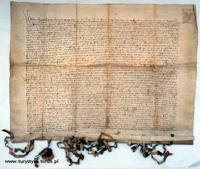 The act of incorporation, issued on 6 March 1454 in Krakow, was tantamount to the declaration of war, i.e. the Thirteen Years’ War. In 1455, on the initiative of the Teutonic Order, Pope Calixt excommunicated the Prussian League and its allies, including Poland, which, however, proved to be an empty promise. Erection act of the Prussian League, Kwidzyn, 14th March 1440. Click to enlarge. Prussian League's oath to the Polish King Kazimierz Jagiellończyck (Casimir Jagiellon), Toruń, 15 th April 1454. Click to enlarge. Founding their first city, the Teutonic Order did not presume it would become a significant urban centre. Initially, a higher rank was envisaged for Chełmno, which was to become the capital of the Teutonic State. However, the remarkably rapid development of Toruń, beside the privileges granted to the new German-speaking colonizers, was encouraged by its excellent location. It fostered not only the population and economic growth, but also contributed to increasing the city’s significance on the political arena. Toruń’s development was conducive to both its territorial growth in the mid 13th century and the foundation of a new urban centre in its vicinity in 1265 - the New City of Toruń - and numerous suburbs around it. Toruń was situated on the intersection of long-distance land and water routes (leading from the south to Ruthenia and the Baltic Sea). It was also ‘the gate to Prussia’ – the most distant outpost of the Teutonic State on its south border, which was a natural base for a variety of political meetings and events. The city was large and well-prepared enough to receive numerous visits of civil servants and the kings. It was in Toruń that the two most important peace treaties and a truce were signed. Here a large number of talks, disputes and meetings associated with the Teutonic cause were held. As an important city of the Teutonic State, Toruń was also empowered to attach its seals to some of the state documents or international treaties. Admittedly, by 1410, when the Order suffered the Grunwald defeat, Toruń and its inhabitants had been no more than passive observers of the events. Only later did the events provoke Toruń to participate in the course of events as an autonomous political unit with an important and decisive say. Taking the oaths of allegiance to King Casimir Jagiellon’s delegates by the representatives of the Prussian States, who were then also presented with the Act of Incorporation of Prussia into the Kingdom of Poland. Leaving Toruń, King Casimir Jagiellon went into the battle of Chojnice where he suffered a defeated by the Teutonic Order (18 September 1454). Toruń supported the siege and field artillery with cannons and powder. Negotiations in Dybów castle between King Casimir Jagiellon, Polish and Prussian legates and the Teutonic mercenaries who failed to receive payment from the Teutonic Order. They offered to sell some of the castles they received. As a result, in June 1457, Poland regained three former Teutonic castles and cities, including Malbork. The beginning of the siege of Świecie castle by Toruń and the King’s armies, which ended with a success 11 months later. The castle was garrisoned by the people of Toruń who guarded the Vistula trail from Toruń to Gdańsk. Having settled with the King, they shared the power over the castle and derived 50 percent of the income up to 1520. Peace talks in Toruń between Poland and the Teutonic Order, mediated by Lübeck delegation and the legates of Lüneburg and several other cities of Mecklenburg as the Hansa representatives. One of the Polish delegates was Jan Długosz. The beginning of peace negotiations involving the leading royal and Prussian advisers as well as experts, such as Jan Długosz and Jakub of Szadek, mediated by a Papal Legate, initially held at Dybów castle and later in Artus House. The last truce agreement between Poland and the Teutonic Order, known as Toruń Compromise, signed by Polish King Zygmunt Stary (Sigismund the Elder), followed by the secularization of Ducal Prussia and the act of homage performed by Albrecht Hohenzollern on Krakow Main Market Square. - a peace treaty concluded on 1 February 1411 on Kępa Bazarowa islet in Toruń, between Poland-Lithuania and the Teutonic Order which brought the so called great war of 1409-1411 to an end. According to some of the provisions of the treaty, the lands, cities and castles won by both warring parties were to be returned to their former owners. 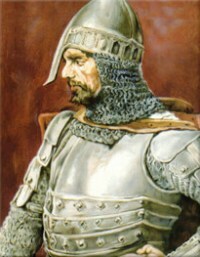 The Teutonic Order relinquished Samogitia until the death of Polish King Władysław Jagiełło (Ladislaus Jagiello) and Lithuanian Prince Witold, while Mazovia regained the Dobrzyń Land. Incorporated in Poland for the period of five months, Toruń fell under the Teutonic rule again, as did the whole Chełmno Land. It was also agreed that the merchants of both states were allowed the unimpeded use water and land trails as before. The oath of ratification was sworn and sealed first by King Ladislaus Jagiello and Price Witold, and then by the Grand Master of the Teutonic Order, Heinrich von Plauen. The sealed documents were eventually exchanged in Złotoria in May 1411. The treaty failed to bring lasting peace between the Teutonic State and Kingdom of Poland-Lithuania. Fighting resumed as early as 1414. The First Treaty of Toruń, concluded after the ‘great war’ of 1409-11 and, following the enormous success of the Jagiellon army in the battle of Grunwald, failed to equal the significance of the Polish-Lithuanian victory over the Teutonic State. After the Grunwald victory, the risk of military confrontation with the Order was still looming, considering that the latter received the support from Livonia and the Reich. This and Sigismund of Luxembourg’s attack on Lesser Poland precipitated the decision to settle with the Teutonic Order, and thus the King initiated negotiating the peace agreement. The peace treaty nonetheless indicated the decline of the so far invincible Teutonic Order. It happened on St. Doroty’s Day in February 1454. On a foggy morning, Toruń delegation appeared near the castle accompanied by a trumpeter and in his presence demanded to have a word with Commander Albrecht Kalba. Never before in the history of the Teutonic State had it happened that its subordinates demanded rather than asked to talk to the Commander. The city had been in a state of confusion for two days. Toruń had risen against the Order, taking the lead in the nationwide revolt. Familiar with the situation, the Secret Council of the Prussian League had been holding talks with the King of Poland regarding his protection and voluntarily incorporating Prussia into the Kingdom of Poland. 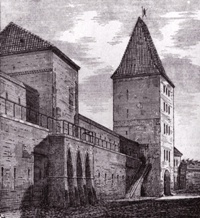 The Teutonic officials and few knights found shelter in the castle, which was nonetheless scantily equipped with food and weapon as a result of the blockade cunningly prepared by the people of Toruń in advance; the scanty castle garrison consisted of 12 knights, some mercenaries, menials and servants. Meanwhile, the burghers had been secretly gathering by the castle, hurriedly preparing to regain it. They had arranged with a befriended cook, Jordan Warzywoda, to wait for his signal to start the attack. At the right moment, when the Knights had already treated themselves to wine and mead at breakfast, he mounted the castle tower and waved his wooden spoon. At the prearranged signal, the burgers pounced on the castle. Curious about the attack, Warzywoda remained in the tower for a while watching the battle. Having crossed the moat, the burghers climbed the castle walls and prepared to blow the tower first. They set and kindled the fuse quickly. Unfortunately, Jordan failed to leave the tower in time and was thrown into the air by the explosion. He was long soaring over the city until he landed on the Chełmno Gate (Polish: Brama Chełmińska). Pale with fear, he remained there for a few days until the burghers; rejoicing over capturing the castle took the kind-hearted men down cheering with joy. To honour the hero and commemorate his achievement, they hung a metal flag depicting the cook with a wooden spoon in his hand on the Chełmno Gate. It stayed there a few years until the gate was demolished in the 19th century and is now exhibited in the Disctrict Museum of the Old City Town Hall. In the decades to come, dragons and basilisks were still seen flying over the ruins of the castle, while the burghers formally celebrated the anniversary of their destructive act long into the time of the Prussian Partition of Poland. So the legend goes, yet according to some building document of 1520, the gate may have been occupied by a certain cook who may have hung out the flag as an advertisement. Anyhow, the castle surrendered as early as two days after the attack, i.e. on 8 February. The defendants were interned first in the Old City Town Hall and then in the Franciscan cloister. They were released several days after they had sworn not to fight against Toruń ever again. The triumphant burghers gave vent to their hatred mocking the Teutonic Knights and destroying their castle. The spontaneous act was turned into an intentional demolition by the City Council to prevent any future authority (Polish or Teutonic) from maintaining military forces in the city. Cook Jordan - historical vane previously on the top of the Chełmno Gate, now in the District Museum. The Chełmno Gate with the vane of cook Jordan. Click to enlarge. 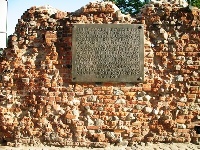 Teutonic castle ruins in Toruń - Northern wall with the commemorative plaque dedicated to the uprising and pulling down the castle in 1454. - a large armed conflict following the pledge of allegiance by the Prussian League to Polish King Kazimierz Jagiellończyk (Casimir Jagiellon; 4 February 1454) and incorporating the Teutonic State into the Kingdom of Poland (6 March 1454). The war was declared on 20 April 1454 and concluded in 1466 by the Second Treaty of Toruń. The conflict was preceded by a nationwide revolt against the Teutonic Order on 6 February 1454, started by the assault on the Teutonic Castle in Toruń. As early as 10 February, shortly after the conflict started, the delegation of the Prussian League set off for Krakow to submit Prussia to the Polish King. The city’s loyalty to the Kingdom of Poland rarely wavered. During the first stage of conflict, Toruń paid homage to the King (28 May 1454). In effect, the city earned numerous privileges (year 1457), which placed it on a par with other Polish cities in terms of their rights. During the war, Toruń was the headquarters of the Prussians and the Polish monarch, serving as the base for military operations. In effect, numerous foreign delegations led by papal legates visited Toruń to take on mediation roles. The wartime events established Toruń as a recognized representative of the interests of the little towns and knighthood in the Chełmno Land; a mediator in a number of particular and general matters between the members of the Prussian League, as well as between the League and the King of Poland; and the coordinator of a large number of political, military and economic activities in Prussia. The City Council continued to maintain close relations with the King and was informed about any matter that bore some relation to the conflict. Its representatives participated in the negotiations between the King and foreign delegations with regard to war. The political integrity of Toruń inhabitants helped the city play a nearly managerial role in striving to achieve the goals set by Prussia and the city itself. Affluent Toruń for long continued to support the war financially, which resulted in the revolt by the burghers against the burden of allegedly excessive taxation in 1456. The riot was suppressed by the City Council (68 people were beheaded). The power of medieval Toruń was reflected in the amount of money the city allocated for military purposes. 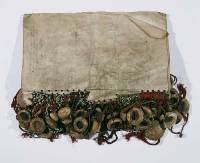 The amount spent on the war with the Teutonic Order reached 200,000 ‘grzywnas’ (a monetary unit used in Poland in the Middle Ages), which equalled the 80-year annual income of the capital city of Krakow and the 270-year annual income of Poznań. The war took the greatest toll on Toruń suburbs, which, along the neighbouring villages, were burnt by the Teutonic Knights in 1455. The fire of the New City of Toruń destroyed nearly half of the houses the and St. James’s Church tower. - the treaty between Kingdom of Poland and the Teutonic State concluding the Thirteen Years’ war, signed on Sunday, 19 October, in Toruń Artus House. It provided that the western part of the Teutonic State (i.e. initially autonomous Royal Prussia), including the Vistula Pomerania (sea access), the Chełmno Land, Żuławy and Varmia (see map here and here), was to be returned to Poland, whereas its eastern part (later Ducal Prussia) was to become Polish fief. The treaty was signed in the city which earned much popularity for its loyalty and being the first to rise against the Teutonic Order. In return, it was granted a number of royal privileges, as well as villages and granges which formerly belonged to the Teutonic Knights (the total amount of the urban property equaled over 30 thousand ha, compared to the 4.2 thousand ha before the war); Toruń gained the villages by the right of nobility, so far awarded only to the capital cities of Krakow and Vilnius (on the one hand, it was obliged to provide military support in warfare, but on the other hand, it was exempted from taxes and quartering). It also came to be termed an autonomous royal city, gained the right to participate in the Prussian diets, achieved the exemption from making contributions to the King, and was represented by a burgrave, selected from a number of candidates designated by the City Council. King Kazimierz Jagiellończyk (Casimir Jagiellon) was the first to seal and swear by the provisions of the treaty, followed by the Grand Master of the Teutonic State, Ludwig von Erlichshausen. The event was commemorated by a huge painting depicting the settlement, painted by Toruń artist, Marian Jaroczyński, in 1870-1873. It is housed in the District Museum of the Old City Town Hall. On the 500th anniversary of concluding the war, a memorial medal was minted. Commandery (komturia) was an administrative unit of the Teutonic State, often with a Teutonic castle and the neighbouring area. The commanderies were established after suppressing the first Prussian revolt of 1246 (see: the Origins of the Teutnonic state) and consisted of a castle and the area they owned. They were occupied by convents and strong garrisons, which allowed a better control of the subject territory. In 1400, there were 25 commanderships in the state. In 1263, part of Toruń commandery was further subdivided into Bierzgłowo commandery (Bierzgłowo castle), and around 1275, into Kowalewo commandery. Since its foundation, Toruń commandery had resided in the Teutonic castle; here worked the first Toruń commander, Rabe, as early as 1251. The Commander, appointed by the Grand Master and approved by the convent, was the chief administrative, judicial, financial and, above all, military authority in the commandery. He was also the leader of the castle convent which, according to the rules of the Order, should consist of 12 knights (nearly all of whom performed certain functions in the Order, such as, for example, those of a deputy commander; marshal; hospitaller; draper; forest, fishing and cellar managers; chef, treasurer and steward) and 6 priests. There were also servants, employed to deal with lower-level administration and housework. One brother normally had two squires and three horses. The commander had his subordinates, such as the stewards of the Teutonic granges or that of the castle in Old City of Toruń. Additionally, he was a chief commander of knights and burghers obliged to perform military service. Toruń commanders originated mainly from Thuringia and Upper Saxony. Toruń commandery comprised the Old and the New Cities of Toruń, Toruń castle, the castle and grange in the locality of Stary Toruń (Old Toruń), the fortified mill and grange in Lubicz, mansions in Mlewiec and Jedwabno. Additionally, there was a large number of villages owned by the Knights. The affluent Old City of Toruń, however, secured a large autonomy from the Order. 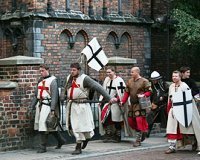 Come and see the remains of the powerful Teutonic state in the Chełmno Land – the first and oldest territory of the Teutonic Order in the Polish land. It was in Toruń and the Chełmno Land that the conquest of Prussia began and the Teutonic state came into being; here the network of brick structures developed. Find out about the historic places associated with the conquest of Prussia and the Teutonic Order, as well as about the history of the Polish-Teutonic conflict. See the remains of the once powerful Teutonic State which, founded in Toruń and the Chełmno Land, quickly grew to spread over neighbouring territories. It was the Teutonic Knights that brought with them the civilization, new economic patterns and the popularity of brick architecture, which determines the peculiar character of Toruń and the region today.